St. Vitus cathedral is the most beautiful and ostentatious church in Prague. In its history we find reflection of the beginnings of the Christian culture in Czech lands. It serves as a mausoleum of Czech kings and the corronation jewels are stored here as well. The cathedral started being built towards the end of the first millenium and was not finished until the beginning of the 20th century. The first shrine on the area of today’s Prague castle, which has been a royal seat, was built around 927 by Prince Vaclav. The remains of this rotunda were found by architects between 1911 – 1929. It used to stand on the St. Vitus area until 1060 when Prince Spytihnev founded a Romanic basilica. Its construction was finished by Prince Bretislav II. 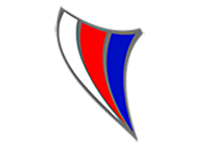 In 1344 the Pope promoted the Prague episcopate to archiepiscopate and Chales IV. founded on the same place a Gothic cathedral. The project was inspired by a dome in Narbonn, France and was overseen by a French constructor Matyas from Arras until 1352. He built a presbytary of the church, gallery and wreath of pentagonal chapels between the vestry and the Chapel of Saint Cross. After his death Petr Parler took over. He built other chapels – this time in right-angled shape, an isle, triforium above the arcades, window wall of the nave, vault and the lower part of the main tower including the Gold Gate. A few sculptures, a statue of St. Wenceslas, statues of Premysl I., Premysl II. and Spytihnev and other members of the Premysl family for decoration of their tombstone, busts for the interior triforium, were built at the time he was in charge of the construction. After Petr Parler died his sons took over and carried on with the construction. At the beginning of the 15th century the construction was interrupted by the Hussite wars.Attempts by Vaclav Jagelonsky and Leopold I. to revive the construction did not succeed. A significant advancement was reached under the leadership of Josef Kranner, Josef Rocker and Kamil Hilbert between 1860 – 1929. During this time the construction of the cross aisle was finished. Moreover, the Western part with chapels and two towers was added to the face of building. Nevertheless, the interior of the church was not completed and therefore the work on it continued throughout the whole of the 20th century. 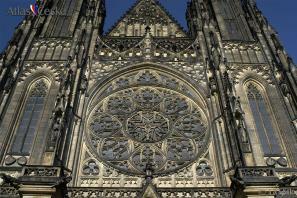 St. Vitus Cathedral, as visitors can see it today, belongs among the most important Gothic buildings. It has a transversal wall, three towers, gallery and a ring of chapels behind a sacrarium. No less spectacular is the interior decoration of the cathedral. There is a huge Gothic arch supported by 28 pillars. The lower part is formed by arcades whilst in the upper part there are huge windows. Above the arcades along the whole perimeter of the church there is a triforium, portrait gallery. 21 busts of members of the royal families and other people who had merit in the construction of the cathedral are located here. Among others we can find here Jan Lucembursky, Eliska Premyslovna, Vaclav Lucembursky, Jan Jindrich, Charles IV., archbishops Arnost from Pardubice, Vaclav Jan Ocko from Vlasim, Jan from Jenstejn, and architects Lopard Busek, Mikulas Holubec, Vaclav from Radec, Benes Krabice from Weitmile, Matyas from Arras, Petr Parler and many others. The oldest ones were created in Parler’s iron mill. The newer ones then by J. Stursa, B. Kafka, L. Kofranek, B. Benda, J. Lauda and J. Kavan. The main alter of the cathedral is in a neo-gothic style. It was built between 1868 – 1873 according to the plan of J. Kranner. Along the sides of the choirs there are wooden benches for capitulars of the cathedral. They date back to the 17th century. On the left hand side there is an armchair for the archbishop. In front of the choir stalls there is a royal tomb. It is a Renaissance piece of work made from white marble between 1564 – 1589. The tomb is decorated by statues and reliefs created by a Dutch sculptor Alexandr Collina. On the top desk there is a standing figure of St. Salvator. Also there are tombs of Ferdinand I., his wife Anna Jagelonska and their son Maxmilian. On the side walls there are their medallions with busts of Czech kings and queens. There are Charles IV and his four wives, Ladislav Pohrobek and Jiri of Podebrady. Their bodies are together with other family members in a tomb under the mausoleum. The tomb is accessible from the Chapel of Saint Cross. The royal tomb is fenced by a metal-tipped grate made in 1589. The western forefront of the church is decorated by a window depicting the creation of the world by Frantisek Kysel. It is festooned with sculptures of 14 saints, Charles IV and busts of J. Mocker, K. Hilbert, Z. Wirth and F. Kysela. They were all created in 1929 by V. Suchard. Next to the Chapel of St. Cross there is a royal oratory which was built in 1493. Authorship of this oratory is attributed to Benedikt Rejt from Pistov. The front part of the oratory is decorated by knotted branches made of stone woven together. On the railing of the oratory there are placed emblems, for instance Dalmatian, Polish, Czech, Moravian, Silesian, and others. Next to the oratory there is a side entrance to the cathedral. The main entrance to the cathedral is formed by three portals with mighty bronze gates. Their plastic decoration was carried out by O. Spaniel according to the plans of V.H. Brunner. Scenes from the time when the cathedral was being built between 925 – 1929 are depicted on the gate. The left gate features the legend of St. Wenceslas and the right one the legend of St. Vojtech. The main tower is 99,5 m high and the entrance to it is next to the Thun chapel. On the first floor there is the biggest bell in the Czech Republic, Zikmund. It is 2m high, its diameter is 2.6 m and it weighs 17 tons. It was molten in 1548 by Tomas Jaros from Brno. On the top of the tower, under the copper cupola, there is a Rennaisance gallery which allows a spectacular view not only of the cathedral and Prague castle, but the whole of Prague.